How do I connect the headset and the USB Controller to my PC or PS4? How do I clean my Razer Thresher headset? We cannot say with certainty what type of dirt and debris may be on your product, or how certain cleaning products may react with it, but we have had good results cleaning Razer products using commonly available monitor cleaning wipes. To clean the body of your Razer headset please take a monitor wipe and use gentle wiping motions. Do not scrub the surface of your Razer headset. When cleaning the earpads on your headset, take extra care to not get any liquids inside the earcup and onto the speaker itself, as this may damage your headset. What is the difference between Thresher and Thresher Ultimate and Thresher 7.1? 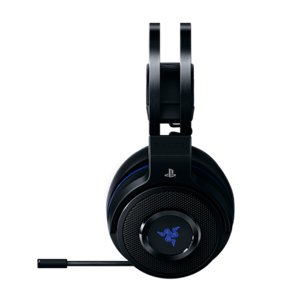 Thresher for PS4 is a stereo headset with analog jack, while the Thresher ultimate and 7.1 has Dolby virtual surround, but without analog jack. Will the volume control on the headset still works if I plug in with 3.5mm jack? No, the volume will be controlled by the volume controller wheel on the 3.5mm cable instead. My Thresher headset doesn’t seem to connect with the USB Wireless Dongle even though the LED is blinking. Why? Press and hold the headset power button until you hear the ON tone and the LED indicator is lit, Keep the devices within close proximity of each other for a faster and more stable connection. The notification LED will turn to static blue when connected to the USB wireless dongle. Are my headset and USB wireless dongle pre-paired? Yes! They are pre-paired out-of-box for your convenience to use them right away. Simply turn on both devices and they will be connected automatically. Does my thresher come with 7.1 Dolby Surround Sound? No, it’s a stereo headset.